Jasmine Rutschmann is extremely passionate about creating unique pieces of art. Growing up in Port Perry Ontario she learned how to use various tools in her Dad's welding shop. Her artwork has been displayed at various craft and art shows and it is continuing to gain recognition within the community. She recently won the Uxbridge Juried Art show and is so honored to be recognized for her work. Her love for art flourished when her love for sports had to be put on hold due to an injury. After breaking her collar bone she needed a way to pass the time as she always loved to be working on something. This is when she went out to her Dad's shop and picked up a plasma cutter and found her new passion. Everything happens for a reason and she is a strong believer that though the injury took her away from one passion it allowed her to find another. Jasmine is happier than she has ever been to be working and creating sculptures. Starting with 100% recycled materials she experimented and developed her artistic abilities. Carving out nature scenes and floral designs on found objects such as old shovel heads, wheelbarrows, metal umbrella tables and saws. These re-purposed materials have served as very unique canvases to showcase her art. It makes her very happy when someone looks at her art and then realizes what it used to be and what it has now become. This is a picture of Jasmine and her Dad Rob on her Prom day in 2015. Jasmine wants to thank her Dad for all the inspiration and constructive criticism over the years. His favourite thing to say growing up was do you want me to tell you the truth or a lie? Of course she would want the truth. Through all of his hard work over the years of running his own business RAHM Industries Welding and Storage it taught Jasmine to work hard for anything you want because no one will ever give it to you. His courage over the years raising two daughters teaching them about respect and to never let anyone get them down has contributed greatly to Jasmine's success. ​ She jokingly talks about growing up beside a welding shop and always being told "Don't stare at the blue light!" this intrigued her curiosity about what the blue light was. Of course she eventually found out first hand and knows how lucky she is to have a supportive father like Rob. Her father was there for her no matter what the situation and always with a smile. It takes a great person to have such a profound and positive impact on someones life but it takes and even better father to give his daughter all the opportunity she could wish for. 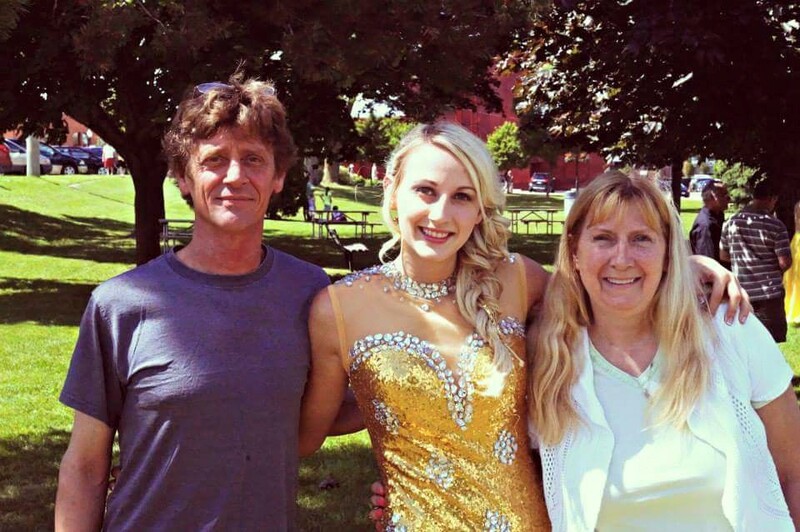 Growing up in Port Perry Jasmine is so grateful to have been gifted with two amazing parents. Her mom was always there to support her with concern for her health and happiness. As a registered nurse Kim always tended to her two daughters with love and care and knew exactly what to do when anyone got sick. Kim is an over all amazingly beautiful mother, person and soul. She manages a busy work life with family time extremely well. Kim taught Jasmine to always keep working towards your dreams and goals no matter how big. She taught Jasmine how important education was and she lead by example. Advancing her career over and over again. Kim is now the Director of Care at Taunton Mills Nursing home in Whitby. Kim never stopped pursing her dreams and has got to one of the top leadership positions in her career. What an amazing accomplishment she worked very hard towards. Kim showed courage to follow her dreams and hasn't stopped working on personal development whenever she could. Leadership course after leadership course. She has more certifications than one can count. Jasmine wants to thank her Mom for being the best influence and role model in her life. She wouldn't be where she is today if it wasn't for the support she received from her family and friends.